Travel with Thomas from Jerusalem to England in this exciting conclusion to the Merlin's Immortals series. Thomas is finally in the Holy Land and reunited with Sir William, but is forced to travel on his own from the coast through Nazareth, and finally to Jerusalem. The road is a dangerous oneespecially to a lone traveler. Bandits masquerade as slaves, traitors appear to be allies, and once again, Thomas doesnt know whom to trust. He must rely on his own resources to discern friend from foe, and to finally discover the final key to the Druids' master plan before returning home to expose them. Back in England, a final storm is brewing against Thomas, for the Druids are much more powerful than the Orphan King can even imagine. With more than three million books in print, SIGMUND BROUWER is the best-selling author of dozens of popular books for children and adults. Over the last two decades, his Rock and Roll Literacy presentation has inspired students and teachers at schools all across North America. Sigmund is married to songwriter and recording artist Cindy Morgan. The couple and their two daughters divide their time between Red Deer, Alberta, and Nashville, Tennessee. 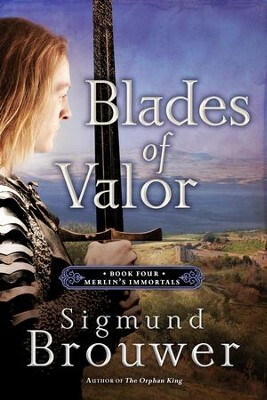 I'm the author/artist and I want to review Blades of Valor: Book Four in the Merlin's Immortals series - eBook.